Are you a “Big Cheese”? The Mickey Mouse Penthouse could be your ultimate Mouse Pad. I’m excited to show you around the place in today’s post, the second in our series that features the signature suites of the Disneyland Hotel, we first showed the Big Thunder Mountain Suite. This signature suite is designed for “big cheeses” of all ages and offers spectacular views of the 500-acre resort (including Disneyland Park, Disney California Adventure Park and the Downtown Disney District) through floor-to-ceiling windows. 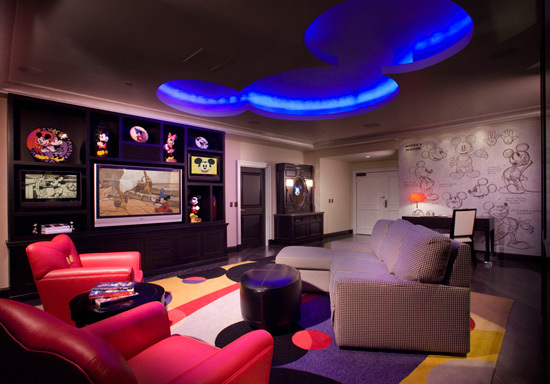 The suite brings to life all the fun that Mickey Mouse represents. The swanky penthouse, featuring an interior design with “Mickey’s” signature colors of black, white, red and yellow, occupies an expansive 1,600 square feet and includes an open living room, dining and kitchen area, two bedrooms and two and one-half bathrooms. 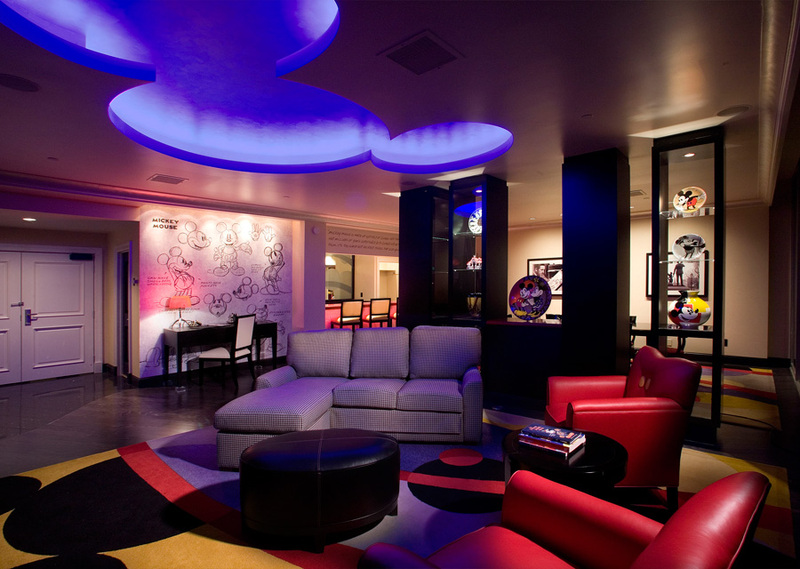 Classic Mickey Mouse imagery and three-dimensional artwork dominate the design scheme throughout the penthouse. Photos and sketches from the Disney library are prominently displayed, featuring images of Walt and Mickey rarely seen by the public. In the living room, guests encounter stylized contemporary décor featuring eclectic furnishings, Mickey motifs and hardwood floors. A giant impression of Mickey Mouse fills the ceiling, as glowing lights enhance the mood of the room. The formal dining area seats eight guests. A built-in media wall is the focal point of the living room, featuring three flat screen TVs and a state-of-the-art home theater system worthy of Mickey’s status as one of Hollywood’s brightest stars. The master bedroom is filled with luxury amenities including a king-size bed, lounge chairs, a 37″ flat panel TV and a DVD player, and it’s decorated with animation maquettes of Mickey Mouse in many of his most famous film roles. (Maquettes are three-dimensional models used by Disney animators to effectively render a character in two dimensions, and they are highly sought-after collectibles). The master bath includes a steam shower, Jacuzzi tub and a double vanity with a built-in TV in the mirror. 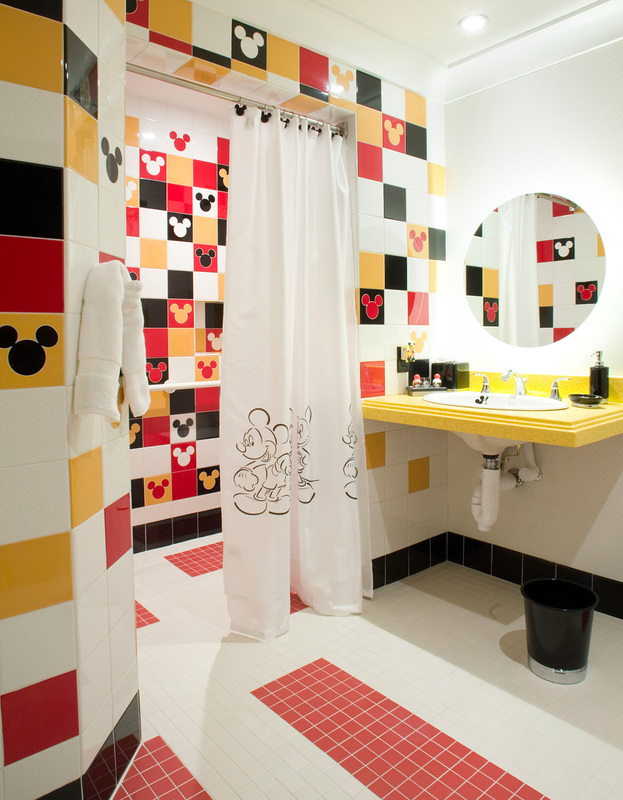 Unique glass tiles on the shower walls bring the magic of Mickey Mouse to life as the familiar image of Mickey appears only when the warm water of the shower hits the tiled wall. The second bedroom has a playful feel, featuring a round bed, and it doubles as a playroom for little ones. The main “conversation piece” in the room is a cutting-edge animator’s station, a high-tech table that adds to the Mickey Mouse and animation-inspired storyline. The desk will help budding artists take sketching to a new level as they draw their favorite character and watch it come to life through the magic of Disney technology. The bedroom also features a Mickey Mouse built-in armoire with a flat panel TV, DVD player and video games. September 18, 2010 in Disneyland Hotel Signature Suites.